At Great Lakes Wholesale Group we have a commitment to providing a wide selection, friendly and knowledgeable service, and great overall values. This new website offers easy access to supplies and equipment to pamper, play with, care for, train, and groom dogs, cats, birds, fish, and other small animals. We also distribute wild bird food. Let us help you to provide your customers the products pet lovers need. A pet section in your store can often generate higher margins, and because most pet products are consumable or disposable, they can also generate recurring sales to your regular customers. 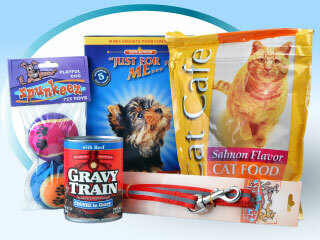 Choosing Great Lakes Wholesale Group as your pet product supplier is easy with small case packs and low price points. Dollar Stores can find wholesale dollar pet items using the price filter at the top of the screen. (Note: you must be logged in to use the filters.) Some of our most popular items include Gravy Train Dog Food, Spunkeez Pet Toys and Accessories, Heath Suet Cakes, High Country Bird Food, Just For Me Dog Treats , Sunshine Pet Food and much more! To review our entire Pet selection, click on PET FOOD below to start browsing.